One of the items on my New Year’s resolutions for the home is to finish the face lift of the kids’ bathroom. 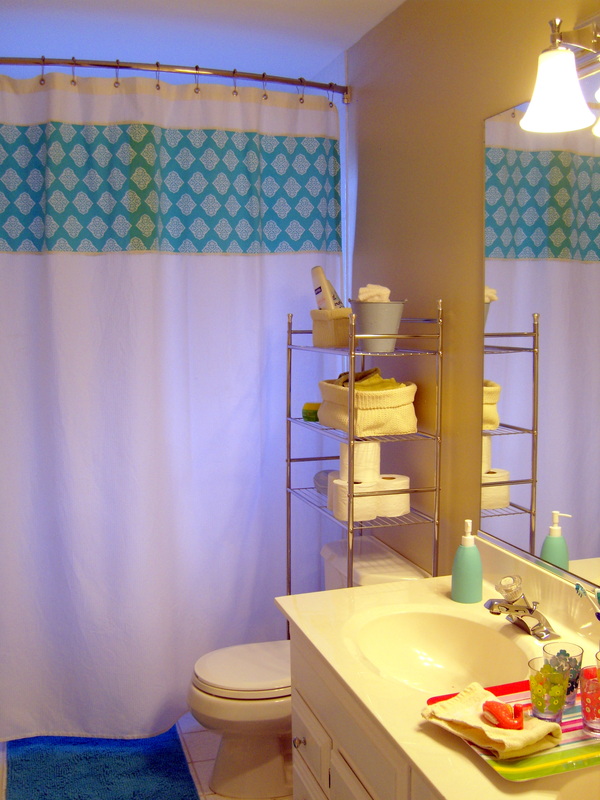 It already had one makeover three or four years ago, when I stripped the floral wallpaper, repainted the vanity, and changed the light fixture. 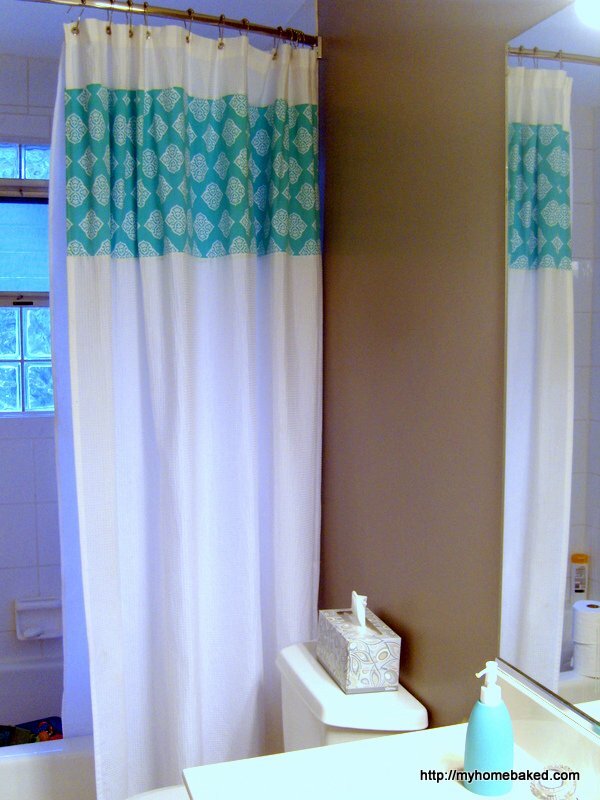 Later I added a chair rail with hooks for towels and sewed a shower curtain. But once I added some colorful accessories, I decided that the wall color no longer worked. I bought a couple quarts of gray paint from the mistake bin at Home Depot ($2/quart for Behr Premium Plus), and along with a few tester pots I already had, I slapped several test swatches on the wall. I figured that would motivate me to get it painted. It didn’t motivate me as quickly as I thought it would (maybe because I enter only to turn off the light, flush the toilet, and pick up wet towels). But yesterday I finally spent an hour prying off the shoe molding (someone put silicone caulk on it that paint won’t adhere to, so it needs to be sanded and repainted) and putting a first coat of paint on the walls. The paint is darker than I first envisioned, but I think I like it. 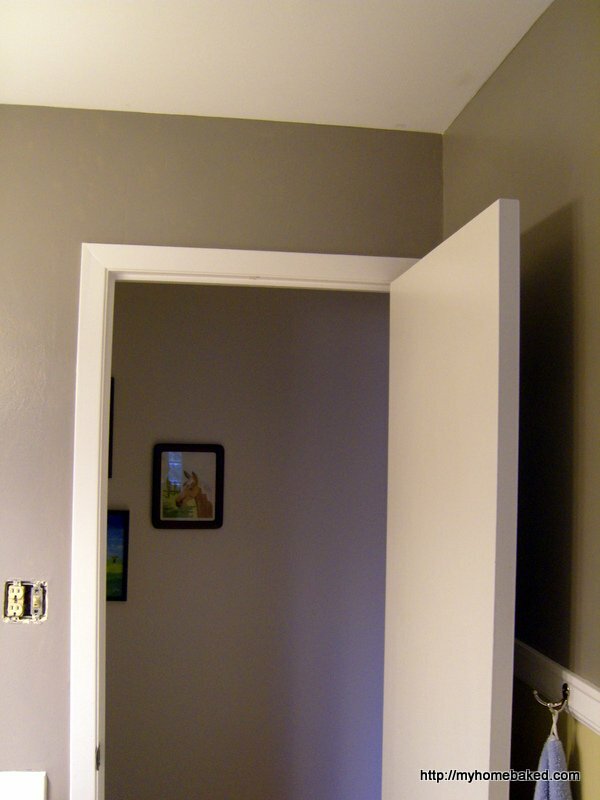 (It’s called Heather Gray by Benjamin Moore, according to the label on the can.) I have white beadboard wallpaper to put under the chair rail, so along with the vanity and all the white tile, there is plenty of contrast. I’ve been saving a stack of the kids’ artwork to display on the wall above the chair rail, and I’d like to put two floating shelves over the toilet. Later this year, I hope we can have an electrician update the wiring in the bathroom and raise the light fixture several inches, so it isn’t sitting against the mirror. Then I’d like to frame the mirror, probably following these instructions. I’m excited! I plan to finish painting today, and follow through with the wallpaper over the weekend. It will be my first attempt at wallpaper, but it’s only half of one short wall. Tomorrow might involve a mad dash to Ikea for some shelves. While I’m there, I might pick up some legs for the computer table for the living room. It’s so gloomy outside that the prospect of completing a project inside makes me very happy. Are you in the middle of any DIY projects? Ahh, projects in February–just what the happiness doctor ordered! Have a great time. I was just thinking about our kids’ bath this morning and how I avoid that room like the plague. I need to go in there and find out what needs some attention. Thanks for the kick in the pants. Am I ever! One trip to ikea and one to Home Depot yesterday, I’m ready to make some magic happen today. ..must. Focus. You’re an inspiration! More ideas churning as we spek.